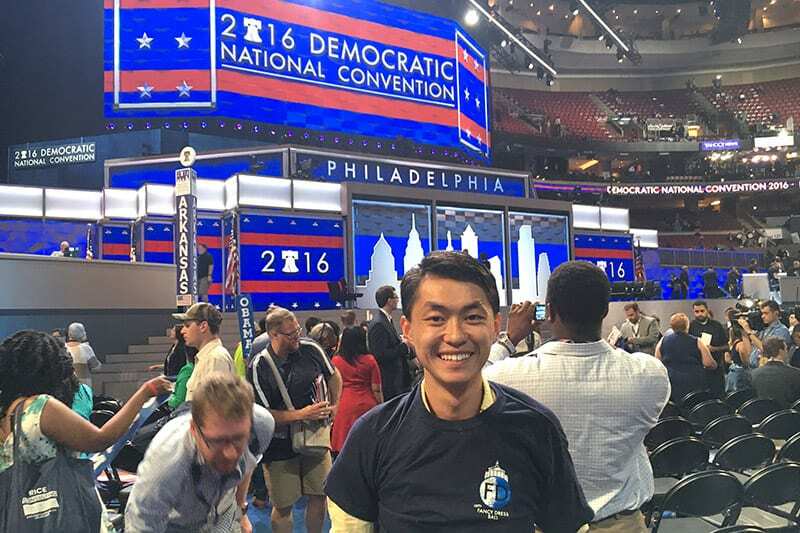 Steven Yeung on the Democratic Convention Floor. Did you participate in Mock Con? What was your role? I was a delegate for the Virginia Delegation, so I guess you could say I’m one of the few to have attended both the 2016 Democratic and Republican National Conventions! I wanted to study abroad my fall term junior year, so I wasn’t able to be more involved in Mock Con. How did you become a delegate? I started by Googling “how to be delegate dnc va,” and Virginia has a nicely laid out to-do list on its website called the Delegate Selection Press Kit. I learned that you had to apply for a local delegate position and choose whether you would be a Hillary delegate or a Bernie delegate. If there were more delegate applications than allocated for your area, then you had to go to a caucus to decide who should be delegates to the congressional and state conventions. Thankfully, I was able to bypass all that and go to the 2nd Congressional Convention (for the Congressional District I live in), which fell on a weekend during spring term. I actually considered not going because of something else going on that weekend, but I was too excited not to go. I made it there five minutes before they stopped giving credentials, and went into the Congressional Convention Hall, which shone with all the elegance of a middle school auditorium. From there, we went through the same procedure as the National Convention by approving the rules and the platform and hearing from the candidate for Congress, Shaun Brown. To actually elect the delegates, we had to break up into two caucuses based on what candidate we supported when we applied. All the Hillary delegates gathered together, and those who stated they wanted to run to be a national delegate gave 30-second speeches. I talked about my involvement with PAACE, various political campaigns, how I drove down three hours to be with them, and also how I believed young people should be more involved. I think they were impressed with my enthusiasm and youthful energy, and they elected me as one of the two Hillary delegates to represent them at the National Convention. You can also be elected at the State convention as one of the at-large delegates, but those are harder to come by since there are only so many spots for so many people. You’ve been involved with politics for a long time? Why? The main reason I got involved in politics was to try to create some discourse and hopefully change immigration policy. As the son of immigrants, I know first-hand how difficult it can be to get a visa or a permanent residence card. My aunt is currently going through the process, and she’s been waiting years just to make it into the States. She chose to leave her comfortable job as a teacher to work in a factory, just so that her daughter can have the same opportunities as you and me. My parents both went through the system, and it also took forever for them. If we can streamline the process and make it easier for international students or immigrants to come and stay, it will have a dramatic impact on America’s future because each immigrant is contributing to our country’s future. By campaigning for and electing the right candidates, we can create that necessary change. I also believe it’s important for my generation to have a voice in politics. Everyone talks about how they want/are glad to see more young people involved. Even before the age of 18, you can have an impact on our politics by campaigning for candidates. By supporting candidates that take stands similar to the youth-voting bloc, we can ensure a prosperous and successful future. Being young was one of the reasons I was elected as a delegate — everyone was happy and excited to see my enthusiasm for politics at such a young age. I was ecstatic to be able to represent Millennials and show that we are a force in politics. What’s been the most interesting/challenging/exciting/unusual aspect of this experience? When you’re at the convention, you’re right in the middle of the election. Democrats from all over the United States came together as one body to nominate Hillary Clinton as their candidate for president. It was so exciting being in the middle of the historic moment when she was nominated and again when she accepted the nomination. You could tell by the energy and aura in the room that everyone was excited for this historic event that closed the gender inequality gap. I was also excited to see other young Democrats from across the nation. We had a substantive showing at the convention, and it only shows that we are becoming more involved. While there was a mix of Bernie and Hillary delegates, we were able to have some great conversations because we had the common factor of being young, and we all care about the future of our country. Getting to meet them and hear their stories was amazing. How did a W&L education prepare you for this role? I think W&L prepared me better outside of the classroom than within it. W&L’s motto is “not unmindful of the future,” which is the sole reason why I’m involved. I know that by being involved I am directly impacting our future. Our quadrennial tradition of hosting the Mock Convention plays directly into that motto, as it simulates the convention and draws awareness to the nominating process. I would say Mock Con is the main reason why I began researching how to become a delegate. The nominating process is somewhat difficult to understand, and I didn’t know what delegates were before this year. Mock Con brought awareness to all of that and allowed me to explore the options that were available to me. Furthermore, W&L has a unique environment that builds the interpersonal skills that were necessary for me to win the votes to become a delegate. I have absolutely no idea. This convention has gotten me energized and motivated to campaign and help elect the right officials all across the country, but I’m also passionate about other areas of work. I have a very addictive personality — I don’t think there’s much out there that I wouldn’t enjoy doing. My job this next year is to pinpoint what I want to dedicate my career to, and it’s not going to be an easy task.